Astronaut Garrett Reisman, Expedition 16/17 flight engineer, poses for a photo after signing the Expedition 16 patch, which was added to the growing collection of insignias representing crews who performed spacewalks from the Quest Airlock of the ISS. Americanastronaut Garrett Reisman is getting reacquainted with gravity and baseball ashe readjusts to life on Earth after three months living in space. Reisman, 40,is looking forward seeing his belovedNew York Yankees play the Boston Red Sox in New York on Sunday, just overthree weeks after returning on Earth following his 95-day trek to theInternational Space Station (ISS). ?I?mlooking forward to coming back and having a real slice of pizza, and seeing myfriends and family in New Jersey and New York,? said Reisman, a Parsippany,N.J.-native, in a recent televised interview. Reismanlaunched to the space station in March aboard NASA?s shuttle Endeavour and returnedJune 14 aboard the shuttle Discovery. Despite months of weightlessness, inwhich the lack of gravity leads to muscle and bone loss, the first-timespaceflyer was well enough to walk out onto Discovery?s runway and take a closelook at the spacecraft after it landed at NASA?s Kennedy Space Center inFlorida. ?It?s beena relatively easy adjustment coming back home and I?m very thankful for that,?Reisman told SPACE.com, adding that even he was surprised by hisresilience. ?I was surprised. I was prepared for the worst.? Just threedays after setting foot back on terra firma, Reisman received medical clearanceto drive his car again, something he expected would take at least a month. ?It turnsout, I am somewhat of a physiological freak,? he said with a laugh. ?It wasn?tperfect, I was still very wobbly.? He chalkedhis success up to regular exercise in space, the fact that his three-monthmission was half the length of those flown by his core Expedition 16 andExpedition 17 crewmates and perhaps his short stature, which anecdotal evidence suggested might make a space homecoming a bit easier. ?I?ve beenreferring to my missions as the Goldilocks flight,? Reisman said in a televisedinterview. ?It wasn?t too short and it wasn?t too long.? 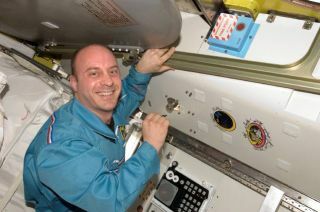 Reismansaid he was proud to be the first Jewish long duration crewmember aboard thespace station. The distinction, he added, was short-lived since hisreplacement Gregory Chamitoff of NASA is also Jewish. Reisman also workedto reach out to people on Earth, tossing out the first pitch at a Yankees-RedSox game from space, appearing on the Comedy Channel?s The Colbert Reportand taping a high-definition video of a day in the life aboard the station. There?s a tremendousamount of curiosity out there of what life is like about the space station on avery human level, on a day to day basis,? he said. "I hope I was successful inthat.? During hisflight, Reisman helped to install and activate a massiveJapanese laboratory the size of a tour bus and its smaller, attic-likestorage room. He also performed one spacewalk during the mission, an excursionthat proved to among the highlights of the spaceflight. Floating inweightlessness, was a close second, Reisman added. ?I?m a fanof Battlestar Galactica, and I was watching that and wondering why thesepeople weren?t floating,? he told SPACE.com. ?Why would you deny yourselfthat?? Reismansaid he reveled in being back home with his wife Simone and their cat Fuzzy. ?It?s beengreat being back home,? he said, adding that little things like lounging withhis family have surprised him most. ?The three of us were on the couch and Ipicked up the remote and started flipping channels. It sounds like a bit oflazy relaxation, but it felt great. ?